If you plan to stay active and keep fit while you’re visiting New Orleans, the many versatile ways to explore the French Quarter and nearby areas like City Park, Bayou St. John, and the Marigny could mean anything from renting a kayak to exploring Bayou St. John, taking free Zumba classes in City Park, or doing yoga at the Cabildo. Depending on your stamina and interests, these indoor and outdoor suggestions, below, can’t be beat if you’re looking for a self-powered, self-guided adventure throughout the city or just need to squeeze in a quick workout while on the road. New Orleans is getting more bike-friendly with recently repaved roads, new dedicated and shared bike lanes, and increased bike safety awareness. Whether you’d prefer to strike out on your own or be guided in a group, the local nonprofit and bike safety advocate Bike Easy has a downloadable PDF city bike map to help you navigate. Plus, no hills! Most tour companies that offer guided bike tours will also let you rent a bike for several hours and up to several days, and most of the time helmet, bike lock, maps, and “concierge support” are included in the rental fee. 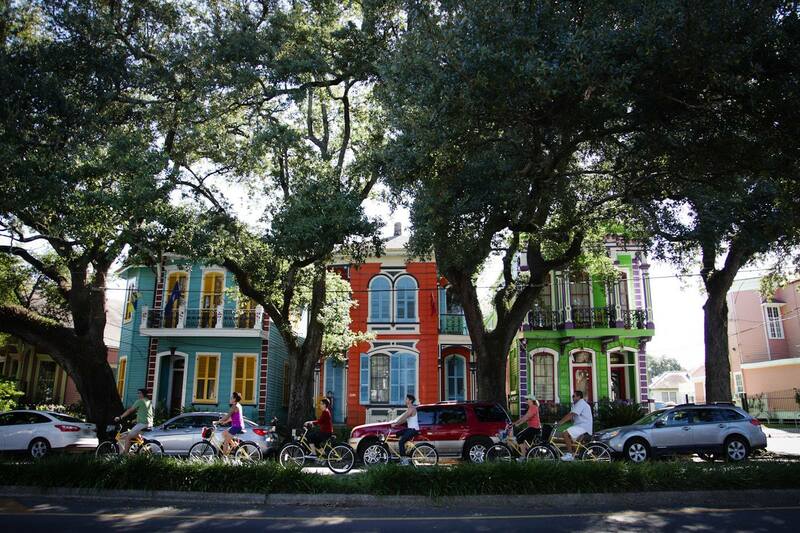 Crescent City Bike Tours offers several 2.5-3-hour bike tours (starting at $49) that focus on New Orleans history. The River Tour takes you from Congo Square to the riverfront and across the river to the scenic old neighborhood of Algiers Point (the ferry fee is included in the price of the tour). The Bayou Tour starts in Louis Armstrong Park and takes you trough the historic neighborhood of the Treme to Bayou St. John, with a stop St. Louis Cemetery #3. It ends in City Park. You can also rent a bike for half a day and up to two days at a time ($25-$60). Free Wheelin’ Bike Tours start at $50, last three hours on average, and cover about 10 miles each. The Creole & Crescent tour includes the French Quarter and the Marigny; Queen of the South tour takes you through the Garden District. The company also has rentals starting at $10/hour for both kid and adult cruisers (multi-day rental fees vary; please check the website). Bullfrog Bike Tours has a Beyond the French Quarter 3.5-hour bike tour (kids 4-12 $35; adults $45) that highlights the neighborhoods of Treme and Faubourg Marigny, as well as Louis Armstrong Park, Congo Square and Esplanade Avenue. Bullfrog’s French Quarter and Garden District tour will take you to the Mississippi Riverfront, Lafayette Square and Lafayette Cemetery #1, among other stops. Bike rentals are adults only, $7/hour and $35 per day (9 a.m. – 6 p.m.). City Segway Tours offers Segway French Quarter tours ($45-$75). They meet near the statue of Joan of Arc and range from 1.5 hours for the evening and “express” tours to the two-hour and three-hour tours. Segway tours are limited to groups of eight people per tour guide; children 12 and older only. New Orleans City Park has free Zumba classes on Saturdays at 8 a.m. at the Peristyle (near the intersection of Dreyfous and Anseman streets). Rain or shine, and no reservations needed. French Market’s Bounce Ya Brass, a free dance class, meets weekly every Tuesday from 5:45 p.m. to 6:45 p.m. under the Mandeville Shed in Crescent Park. Through January 2018, open to all fitness levels. The Sweat Social, billed as “Wellness Services for Travelers,” offers a slew of group exercise services in the French Quarter, including yoga, kickboxing, Pilates, and high-intensity interval training. Classes are $30 per person and scheduled on demand. Exercise surrounded by opulence at the New Orleans Athletic Club on N. Rampart Street on the edge of the Quarter. Established in 1872, the club has seen quite a few famous people, from Tennessee Williams and Huey Long to the contemporary Hollywood celebrities who film here. As one of the oldest athletic clubs in America, NOAC boasts a pool, sauna and steam room, a well-stocked library, spa, coffee stations, and even a bar. A daily drop-in for $20 includes access to group exercise classes, or come as a member’s guest for $10. Bring ID and hotel room key to register. Downtown Fitness Center has locations at the New Orleans Healing Center in Bywater and on the third floor at the Shops at Canal Place in the French Quarter. Day passes are $15; classes include Zumba, yoga, pole fitness, and aerobics. “For residents and travelers at all levels of practice,” Yoga at the Cabildo classes are held at the historic Cabildo on Jackson Square on Tuesdays, Thursdays, and Saturdays, 8:30 a.m. to 9:30 a.m. ($15). History meets fitness in a sun-filled gallery inside a 1700s Spanish colonial building, now houses an excellent museum. For all fitness levels. Wild Lotus Yoga has locations Uptown off Prytania and downtown at the New Orleans Healing Center. It offers sliding-scale community classes like family yoga, alignment and yoga for new moms. A NOLA visitor pass ($50) provides unlimited access to classes for a week. Swan River Yoga is popular among the locals and offers restorative, beginner, and prenatal classes at its Mid-City location on Canal Street for a single class drop-in rate of $15. The two-hour bayou tour by Kayak-iti-Yat is a good fit for first-time kayakers to explore Bayou St. John with not too much athletic commitment. It focuses on history, community and architecture; and, even though the tour will take you through residential areas, you’ll get to spot some wildlife like birds and turtles. Two-person minimum; $45 per person.